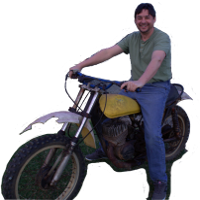 Vintage motocross bike restoration, RV camping and sailing. I remember when I had my 78 YZ100. When I looked in the service manual I would think what it would be like to have the bigger bikes; more travel, aluminum swing arm and of course more power! Now I have this 400 and it's everything I dreamed it would be. While it was in great shape for a 36 year old bike, it definitely needs some attention. Looks rough, but is actually in pretty good shape. I picked up this very sad TM250K to be my first vintage MX bike project. Considering the condition, many would say it isn't worth it, but I like a challenge and hate to see any classics go down. Besides, if I can get this thing back in race condition, I should be able to handle anything, right?